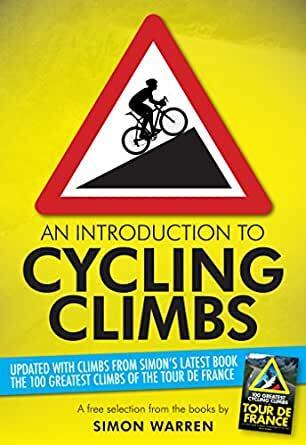 Simon Warren's bestselling guides to hillclimbing have inspired cyclists to share his passion of searching out and climbing the steepest and longest hills. An Introduction to Cycling Climbs is a free digital taster of Simon's 100 Greatest Cycling Climbs, Another 100 Greatest Cycling Climbs, Hellingen - A Road Cyclist's Guide to Belgium's Greatest Cycling Climbs and the 100 Greatest Cycling Climbs of the Tour de France guidebooks. Exclusive - This free sampler includes descriptions and profiles of the Hautacam, the mountain climb that features in the 2014 Etape, and the mythical Mont Ventoux. SIMON WARREN has been obsessed with cycling since the summer of 1989 after watching Greg Lemond battle Laurent Fignon in the Tour de France. A few weeks later he rode his first race, a 10 mile time trial on the A1 from Newark to Grantham and back. Although not having what it took to beat the best he found his forte was racing up hills and so began his fascination with steep roads. His quest to discover Britain's greatest climbs resulted in the bestselling 100 Greatest Cycling Climbs, followed by Another 100 Greatest Cycling Climbs and Hellingen: A Road Cyclist's Guide to Belgium's Greatest Cycling Climbs. Simon works during the day as a magazine art editor and lives in Walthamstow, east London with his wife and two children. I like it, BUT I would like it more if this book would have information closer to my country. But it is great for those who can ride a bike in UK or another european country. Of course this is a demo book. THE BEST OF THIS BOOK is it describes the climbs in a cycling language and the biological aspects involved in climbing (but this part is too short, in my opinion). So, I think if you leave in european countries and are looking for a guide of those mythical climbs and a guide about how to conquer it, this is the book collection for you. Just silly, common sense and actually riding hills is all they should have said. A simple read, but no specifics on American rides. But you can still learn much by reading this book. Keep thinking circles! Not quite what I wanted but got a bit out of it.